AKIPRESS.COM - A special project has been launched to document, digitize and preserve the Islamic geometric patterns and title-work of Central Asia. The Project is called Agama, reports Metropolis magazine. Across the globe, architecture, and the history it embodies, is endangered--not just from the ravages of aging, climate change, or modernization, but, most dramatically, from destruction as a result of conflict. Conscious of this fact, three friends were inspired to act, to help preserve at-risk historical artifacts for future generations. And so Lauren Connell, an architect at BIG, Baris Yuksel, a senior engineer at Google, and Alexis Burson, an associate at Pei Cobb Freed & Partners, put their collective expertise together and created Project Agama, the magazine said. With funding from the Center for Architecture's LeBrun Travel Grant, the trio set out on a six-week journey across Turkey, Russia, Uzbekistan, Kazakhstan, and Azerbaijan, documenting the different tile patterns of the region's historical architectures. Yuksel has since been hard at work converting the tile patterns into code, so that the datasets of patterns will be easily accessible to current day architects, who can potentially adapt them for modern purposes. “We came up with the idea after frequently attending lectures at the Center for Architecture. Almost always, after the talk, we would go to a bar or a restaurant and discuss the lecture, and talk about related subjects. On the day we came up with the initial idea, we were discussing how conflict in war zones was destroying and wiping out some of the most valuable historical buildings and artifacts. So, we wondered if there was a way to preserve some of the world’s common heritage so it isn’t lost for future generations -- a big task. We had already collaborated on a competition using Grasshopper so we had a feeling that if we could distil out the fundamental concepts, we could write them in code and use it for algorithmic generation. 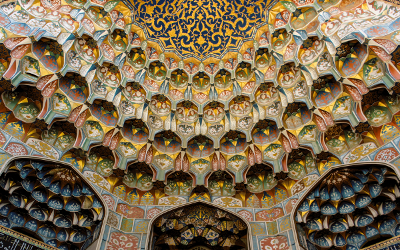 Lauren thought we could apply to the LeBrun Travel Grant (given annually by the Center for Architecture) and focus on tessellations and we decided that Central Asia would be a great place to do this,” the trio said in an interview with the Metropolis. “Our initial concept: Tessellations exist in many forms all over the world, mostly in ancient buildings. Some of these buildings are protected, but some of them face the danger of extinction: earthquakes, storms, wars, and the passing of time all threaten these buildings, and these patterns. It is not enough to just catalogue these in photos and videos, it is our aim to break down the logic of these patterns, and recreate them in code in order to make them more accessible and possibly allowing them to find new life in contemporary applications. By building an open source library, accessible to architects, artists, mathematicians, and software engineers, we can carry these patterns and traditions forward for future generations. Additionally, by building off of Baris’ expertise in machine learning, we are working on methodologies that could potentially pave the way for brand new explorations using ancient techniques,” they said.